The Palestinian Center for Human Rights (PCHR) opened the second training course for this year in the field of Personal Status Law for young lawyers to help them obtaining the license to practice Law before sharia courts. 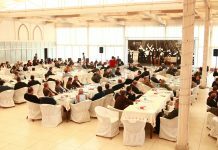 The training course was attended by 40 male and female lawyers from Khan Yunis and Rafah and held between 25 March to 01 April 2018 in al-Sa’adah Land Restaurant hall in Khan Yunis. In the Opening session, ‘Abdel Halim Abu Samrah, Director of PCHR’s Training Unit, welcomed the participants and talked about PCHR’s role in promoting and protecting human rights and PCHR’s services providing for victims of violations. He pointed out that this course aims at strengthening the capacity of trainee lawyers in order to obtain the license to practice sharia law and be qualified for pleading before sharia courts to defend women’s rights. He also invited all participants to head to PCHR to benefit from its experience in all the course’s topics relevant to Sharia judiciary, emphasizing that PCHR’s doors are always open for them. At the beginning of his speech, Sheikh ‘Omer Nofal, Head of the Sahria Supreme Court, thanked and appreciated, on behalf of the Higher Sharia Court Council, PCHR’s pioneering role in strengthening the capacity of sharia lawyers. He added that PCHR has years of great work experience in the field of family law and pleading before the sharia courts to defend women’s rights. He emphasized on the continuous relation between PCHR and the Higher Sharia Court Council and importance of enhancing it in favor of lawyers. He stressed that holding such training courses would help lawyers in improving their professional performance. Convention on the Rights of the Child; Convention on the Elimination of all Forms of Discrimination against Women (CEDAW); Universal Declaration on the Elimination of Violence against Women; Sharia Procedure Law provisions of inheritance and mandated will; the Personal Status Law; family law; Palestinian Execution Act; Lawyers’ Code of Conduct; Cases and Rulings; and Mecelle “the Civil Code of Ottoman Empire.” The 40-hour training course addressed those topics within 7 days consecutively. A team of specialized trainers supervised the training sessions. The team included ‘Abdel Halim Abu Samrah, Director of PCHR’s Training Unit, Mona Shawa, Head of PCHR’s Women’s Unit, Mohammed ‘Atallah, a trainer at PCHR, Hanan Matar, lawyer at PCHR Women’s Rights Unit and Majeda Shehada, a researcher at PCHR’s Women’s Unit, in addition to sharia judges namely Sa’id Abu al-Jubein, Ibrahim al-Najjar, ‘Omer Nofal; and Ahmed al-Buhaisi. Previous articleDeath is haunting patients of the Gaza Strip،Do not Let Tareq Die !